Of course people usually like to post in the main thread where most of the conversation happens, but links etc which are interesting for follow up later get easily lost in fast filling threads. 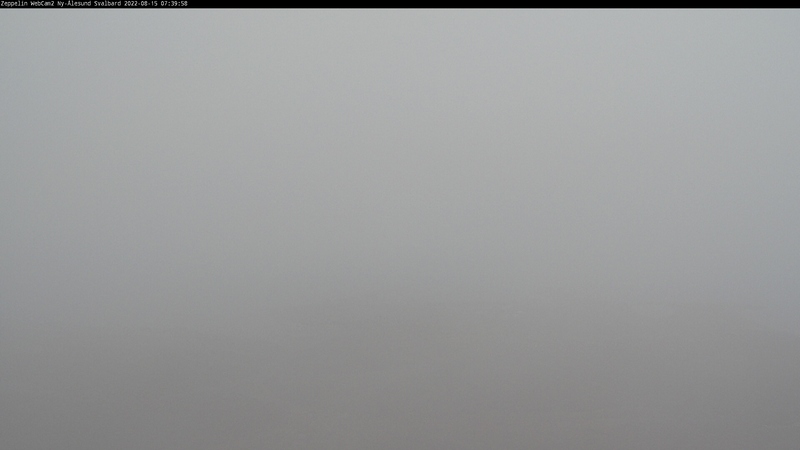 So I'd like to start another regional thread on Svalbard which has some very good resources in weather stations and webcams. Do you know what is included in this area? seems not to get much closer despite the winds and the larger drift of floes within the pack towards the south. Areas east and south are growing I think despite poor visibility. I was doubtful about that but the conclusion must be that the water to the north of Svalbard is warm enough to melt ice despite low air temperatures and evaporation seen in the fog formed as dry cold air streams off the ice. I don't know the boundaries of the MET's "Svalbard" area I'm afraid. The ice edge to the north seems not to get much closer despite the winds and the larger drift of floes within the pack towards the south. 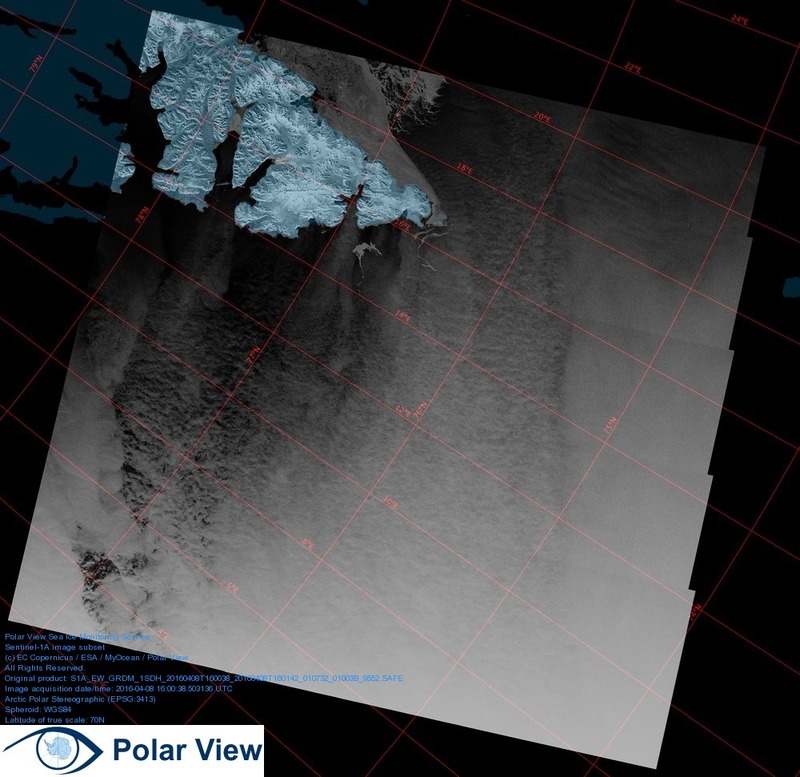 My comment is based on tracing floes (following the shape day by day on worldview is more convincing than the images below) and seeing ice between that floe and the edge disintegrate but it seems that it should spread out more if it would only break up without any melting. looking at climate reanalyzer http://cci-reanalyzer.org/Forecasts/#ARC-LEA for the next week the expanding region of ice east of svalbard will get pushed north again, receive some snow and then rain on its southern edge. It will be interesting to watch how that plays out. I am trying to learn how to use the AMSR2 images available on Worldview. As another complication precipitation (I think) affects the appearance of open water regions. I have marked with +Pr where precipitation (snow) over water shows in green hues which elsewhere indicate warmer ice. I have come to that conclusion after tracking the development of these areas over several days, when they can occasionally be seen in the visible channel. I have also looked on the norwegian weather forecast site http://www.yr.no/kart/#lat=78.68775&lon=29.04281&zoom=5&laga=nedb%C3%B8rskyer&baseid=PunktNorgePolar%3A21%2F13381&proj=3575 for information on precipitation in the areas concerned. If anyone has better information I would be keen to learn more. http://polarview.met.no/Statistics/climatology.html Graphs showing the current sea ice area around Svalbard (0 – 40 °E, 72 – 85 °N). Thanks Diablo. At my advanced age I have difficulty reading text as well as graphs! Possibly the devil is in the detail though? This is the lowest area for this day of the year in our records dating back to 1967. 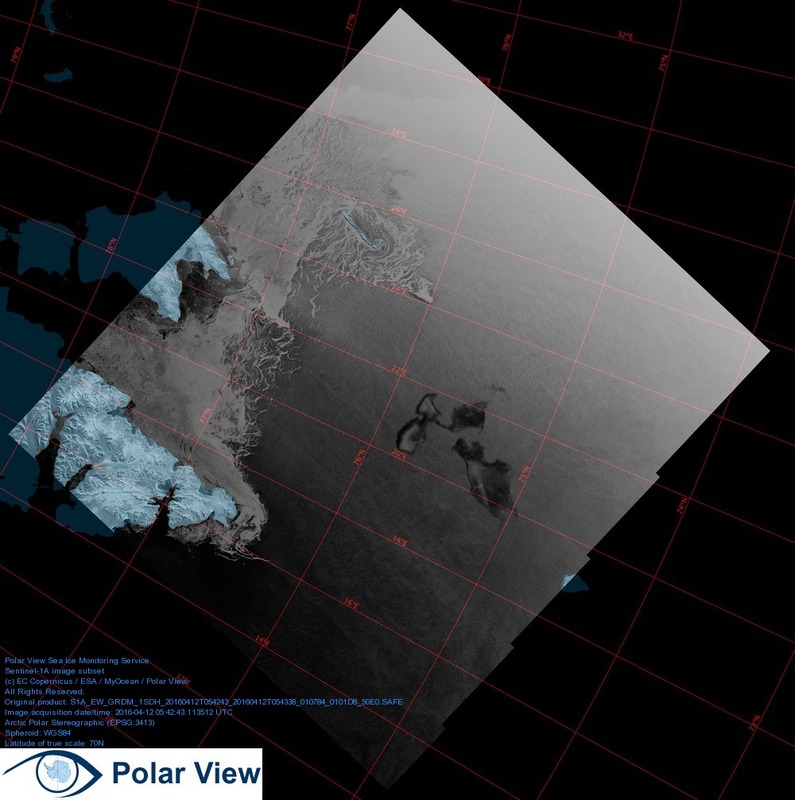 In the south the stretch of ice between spitsbergen and bjornoya is gone (as shown on sentinel 1A http://www.polarview.aq/images/106_S1jpgsmall/201604/S1A_EW_GRDM_1SDH_20160408T160038_9552_N_1.jpg) although it still shown in the ice chart. Interesting to watch the floes drift towards Spitsbergen and disintegrate as they approach. http://go.nasa.gov/23AZrMO Will they reach land if the wind continues to blow in that direction? While there clearly is warm water in the north of Spitsbergen, the southern coast is less hostile to the ice, see the drift east to west around that cape. The temperature around Svalbard is actually pretty low at the moment (relative to the winter we have just had); is it possible ice can form this late? As a general question, what is generally the latest new ice can form? Ice formation is going to be governed by heat loss; the rate of loss at the surface has to exceed the replacement rate provided by conduction, convection and physical mixing. To freeze a 1 meter square 10CM thick block of ice requires it to dump 3.335 million joules worth of heat. That's about 9 kilowatt hours worth of radiation. Anecdotally, for that to happen SST's need to stay consistently below -10C. Add on the fact that we're looking at 6-8KWH/M2/day of incident insolation at that latitude currently, that suggests to me any ice that shows up will have to come from elsewhere. Much of the ice east of Svalbard has drifted from Franz Josef Land, some is thicker and older some has formed as water opened during the last month. I can see recently formed ice in the lee of the eastern islands of Svalbard in yesterdays Terra image. But the outlook is for temperatures rising to about -6 deg C even with winds from the east. The sunlight hours are rising rapidly now and the sun angle also goes up, what the actual radiative balance is now I don't know. But my guess is that freezing will stop now. North of Svalbard more substantial ice is drifting in which has come from further east and has largely been formed at the start of the winter (with some later infill) the fact that the gap between the ice edge there and the islands hasn't frozen over and instead floes disintegrate at the edge despite the wind blowing from the still cold north is a sign of warm water which keeps being replenished despite some substantial cooling by convection and evaporation. Changes in area are going to be determined by transport. That is the dominant feature throughout the summer too in that region. Melt can easily be overwhelmed by transport from elsewhere but that means dropping ice area in those other regions. Thanks. You mentioned there is some new ice; could you tell me how you determined there was? I find it quite difficult just looking at the satellite images for example. I come to that conclusion from watching developments over the last month. On 11. 3. you see landfast ice on the southwest coast of Franz Josef Land which by the 23. 3. has broken away and thin ice has formed behind it as cold winds blow over recently opened water. Since then winds have changed to a more southerly and a more northerly direction but predominantly moving ice to the west. During that time gaps have repeatedly formed, frozen over, moved one way then another. Look at the last three days here http://go.nasa.gov/1SfSRJW you can see whiter (thicker) ice drifting away from the coast followed by greyer shades as ice forms on the water surface opened behind it. I use the AMSR-2 images (89GHz) as a help to follow movement, this channel is not a straightforward indication of thickness or temperature but seems to be influenced by both. This might increase the ice extent shown for the Barents region (depending what the small amount of ice at the Russian coast does) but ice drifting south won't last long. Today the drift towards that region from the north is strong so further developments depend on how that continues. ... continued from previous post. if someone can make this into an animation they would be welcome to use this compilation. Thanks, Andreas! I've been planning to do a post on Svalbard/Atlantic side of the Arctic for a while now. This thread will come in handy once I find the time. Thanks for all your work here. Andreas thank you for these great posts. BTW Veritasium just posted a beautiful video of Longyearbyen on Svalbard. The flows north of that one are doing the exact same thing! while translating sayings is often in vain i'll do m best, it means that whoever might have suspects something evil is a prankster while the opposite is being said or i short that's suspicious, considering who owns the satellites. interestingly as per today that source failed to deliver correct data as well. Thank you for the feed back, I benefit from the work others are doing here so it is nice to know I am able to contribute too. I have been looking for information on the upwelling water along the west and north of Svalbard. One thing which stands out from this how the sea floor falls to a great depth beyond a narrow ledge of shelf there whereas to the south much shallower water especially towards Bjoernoya coincides with the area where ice persists while it melts further north. My line of thinking is that the much above normal temperatures in the region this winter could not directly be responsible for ice free conditions on the north coast. The scale of ice movement towards it for over a month would have swamped any local warmth I would think. Andreas T - I concur with your assessment. I've been going back and forth through the last 10 days of movement around Svalbard. It's irrefutably obvious that ice is melting as it crosses a boundary between 50 and 100KM from Svalbard. The heat has to be coming from current. The volume of warm water coming in on that current would simply dwarf the amount of cold captured in those floes of ice, no matter how large they are. It has to be this current that is melting this ice and I would expect this to continue throughout the melt season. 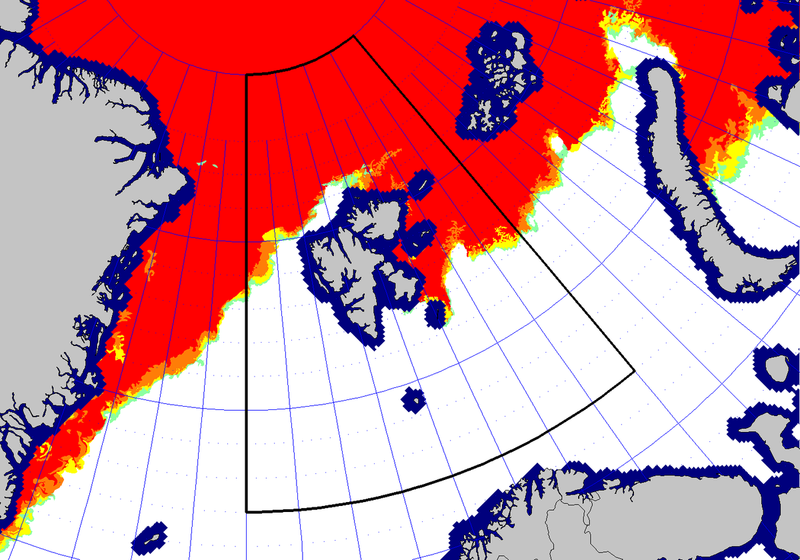 The Fram and the passage north of Svalbard will be a killing field for ice. Very decent observation there by Andreas T. No question about it, the ice floes are melting almost as soon as they meet warmer water despite meagre interaction surfaces. That raises the question of how thick and solid they were to start with. It would also be worth looking at lower Fram to see where meltout begins there in the colder East Greenland Current. Below is a quick 12-day animation pausing on the last date of 21 Apr 16 of the Svalbard/Fram area. This required a so-so 1 km resolution to display as the maximum forum size of 700x700 pixels. I would do melting floes at the maximam resolution allowed, 250 m, and run the ice through adaptive contrast in ImageJ. If you have the RAM, capture a large scene at high resolution once for each of the dates and resize and crop it down fit to later purposes. I'm not sure if I'm more impressed with the speed of melting, or the speed of exit through the Fram. It's a little trickier to animate nullschool winds over the same dates, requiring whole-window screenshots and great care not to mouse over the window, even when in the background. The region of interest might be the overall Arctic wind pattern driving the ice rather than just those in Fram Strait moving it along. Setting nullschool to ocean + currents is not currently informative. Sea surface temperature anomalies is potentially more interesting depending on its accuracy. The once-size-fits-all color palette leaves a lot to be desired for specific situations, 4th image expands it linearly to the case here. Andreas, I've used those images of floe disintegration north of Svalbard for the latest ASIB blog post (as promised). Thanks again. Here is day 105-112 at maximal source resolution of 250 m pixels. I've colored two of the bergs to make it easier to stay oriented. The last frame 21 Apr 16 has some overcast but by now the berg and its neighbors to the north have largely disintegrated. It was initially 42 x 30 km in NS and EW dimensions or 84 km2 by blue pixel count x 250 x 250 / 1000000. The velocity of the blue berg is 14.3 km/d (0.37 mph). A swath 100 km wide would sweep out 1 430 km2 of ice out of the Arctic. Since its area is 14 000 000 km2, that amounts to 0.01% so 1% of Arctic ice if the current situation, improbably, kept up for 100 days. Adding the Fram, 400 km wide at its nearest, yields a 5x multiplier. The age of this ice, especially if the oldest, determines the volume and contributes to significance. Using the sea surface temperature anomaly provided at Nullschool for these dates -- and enhancing the blue (low) end of the palette, an explanation for the melt zone is at hand. While the temperatures don't vary a whole lot over this time frame, note the fast pulse of heat coming up southwest of Svalbard and, again taking the data at face value, the blue anomaly extending quite a ways northwest into the Arctic Ocean. The third image shows the nullschool settings and the color palette before and after. The ocean current overlay has limited utility in this regions. The last image shows an overview of Arctic Ocean winds on 21 Apr 16; these are supportive of ice export. Andreas T has found here the most interesting phenomenon so far of the spring season! I colored in another disintegrating iceberg, slowed the frame rate down, and deleted the final cloudy frame. Before icebergs disintegrate, they acquire what looks like a soggy gray melt rim. It becomes increasingly problematic to define the remaining boundaries in the final days; that is represented in the animation by gradually lowering the percent tint. Note that the blue iceberg marks the disintegration boundary -- bergs to the south seem to survive longer, in the manner of those heading down the Fram on the East Greenland Current. These animations are very easy to make but to guarantee a good outcome, I am finding it best to cruise back and forth throuigh the WorldView dates until the images are cached, at which point the Worldview slider can give a jumpy preview of the animation. The initial position of the snapshot windowing can then be adjusted on key frames to be sure the right stuff will make the cut. It would actually make better use of space to snap a larger window and then rotate/crop the images later so that the motion is straight down (or left to right) rather than diagonal. However that is confusing for viewers used to the standard (fixed) Worldview orientation. People can dowload the gif and step through the frames or change the speed to whatever they want. However it was easier here for me just to add a real slow speed as a second attachment. I am headed over to Beaufort ... a great animation opportunity is shaping up there. Posting this for anyone who, like me, needs a quick idiot's guide to the warm water current flowing to the west of Svalbard. Fab and disturbing animation, A-Team. Really appreciate what you do. Great animation but the description is misleading. These colored things shall not be termed icebergs but sea ice floes. I colored in another disintegrating iceberg, slowed the frame rate down, and deleted the final cloudy frame. Thank you A-team for improving so much on my feeble efforts. What I would like to know about these ice floes, (your excellent work on the Greenland glaciers must make you so used to talking of icebergs) is their thickness. The fact that they disappear within days when just before, further north from the ice edge new ice was forming around them and cold air is blowing over them from the north is what I find so impressive about this. I have tried to trace the path of this ice back to where it comes from and I think I can place it east of Franz Josef Land at the beginning of Oct. 2015. Whether it was new ice then or just survived that summer I can't tell. Good question and nice effort. It is going to be a problem tracking it back through the winter when optical satellites are in the dark, radar won't have the necessary resolution, and diagnostic floe cracks might not have developed. WorldView Aqua cannot see this area between 03 October and 08 March http://tinyurl.com/jz3zreq plus a fair number of days are too cloudy. It does look like 18 Mar 16 on to 18 Apr 18 would make a good trajectory animation. The easiest thing to do is make the browser window no bigger than necessary and step through the dates to put them in cache. Once stored, you can drag the slider back and forth to see if capturing the images as an animation would be worth posting. Yes indeed ice floes are formed from salt water and have brine channels and air pockets that they only lose gradually with age and compression incidents. Their temperature profile with thickness follows from the heat equation clamped to constant temperature water on the bottom and weather/radiation history above. Tabular ice bergs that have broken off a floating glacier shelf such as Petermann's have negligible brine content except for refrozen cracks; however depending on history and snowfall, the upper 100 meters or might be firn, not glacier ice, with greatly lowered density and compressive strength (https://en.wikipedia.org/wiki/Firn). The ice in bergs calving from a glacier like Jakobshavn is fresh water but with a complicated stress/strain and recrystallization history and temperature profile ranging from temperate at the bottom to say -29ºC in the middle to warmer above, depending on which part of the 1400 m thickness a given berg originated from and how long it has been afloat. Ice fabric and embedded till have no real counterparts in an ice floe. Among all your other heroic efforts, such a concise explanation of sea ice floes vs. bergs might seem like a modest achievement, but it is much appreciated. Of course, floes do not add to or subtract salt or water from the oceans, although I imagine that to some degree they might redistribute it, but because melting glacier ice reduces the salinity of surface water and adds volume to the sea, floes and bergs really are different phenomena, even if their melting is due to a common cause. What we’ve been following closely this fall does have consequences. I hit on information about evacuations in Longyearbyen, Svalbard. Caused by unprecedented, torrential rains last month. Looks like failing permafrost and constant arrival of Lows in the Arctic offer another illustration of the fast changes in the Arctic. That pic. !!! How much of the permafrost has melted? 'The normal yearly average at Svalbard Airport is minus 6.7 degrees Celsius, said Ketil Isaksen of the Norwegian Meterological Institute. The warmest year until now was 2006, when the average temperature was minus 1.8 degrees, but he predicts this year’s average will be about zero degrees. As recently as 2008 Svalbard had year-round ice in the eastern islands. "Svalbard has three native mammals, the Arctic fox, the Svalbard reindeer, stockier than its mainland consins and, most spectacularly, the polar bear. Most of the bears live in the east of the archipelago where the climate way from the Gulf Stream is much cooler and ice lasts all the year round." Near the world's most northern railway is the Zeppelin Observatory. The Zeppcam may be of interest.